Previous secessionist challenges in Catalonia - a populous wealthy region whose capital is Barcelona and which has its own language - were blocked by Spain's conservative government and the Constitutional Court. 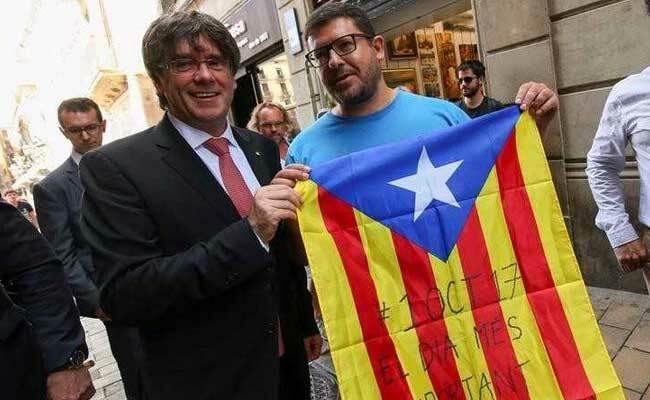 Carles Puigdemont poses next to a pro-independence supporter with a Catalan Estelada flag. Barcelona: Catalonia will hold a referendum on splitting from Spain on Oct. 1, the head of the region said on Friday, setting the stage for months of confrontation with the central government which says such a vote is illegal and must not take place. "The question will be: 'Do you want Catalonia to become an independent state in the form of a republic'," Carles Puigdemont, president of the government of Catalonia, said. He said attempts to agree a date and the wording of the question with the Madrid government - which is vehemently opposed to allowing Catalonia to split from Spain - failed and left him with no other choice than moving unilaterally. Pro-independence campaigners staged a symbolic ballot, organised by volunteers rather than government officials to get around court restrictions, in 2014, months after Scots voted to stay in the United Kingdom. Some 2 million people voted in favour of secession in that non-binding ballot, though turnaround was relatively low. Under Article 155 of Spain's constitution, Madrid has the power to intervene directly in the running of Catalonia's regional government, forcing it to drop the vote.